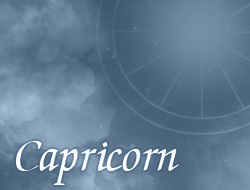 Persons under the sign of Capricorn are characterized by extraordinary ambition and creativity. They always try to do carry out the given activity properly. They stand out with a very high sense of humor, so persons in their surrounding certainly won't feel boredom. This is a very positive character trait. Capricorns very often are witty and funny; tend to be a soul of the party. Very carefully they approach to appointed objectives, but successfully achieve them. Entrusted tasks often perform a bit slower, but far better than other persons. Even if they establish a goal, which doesn’t interest them, they try to achieve it. Such is their nature and it is a positive feature. Capricorns have a great physical and mental strength, as well as high patience to persons from surroundings. Physical strength of such persons not necessarily is involved with a well-built silhouette, since their strength lies inside them, in the strength of spirit and strong will. Persons born under this zodiac sign don't give up of their goals and dreams. They always want and try to achieve everything what they have planned. Even when in their life defeats occur, still they think that it was a certain kind of lesson from them. Thanks to such an attitude they learn on own mistakes, thus in the future don't make them anymore.